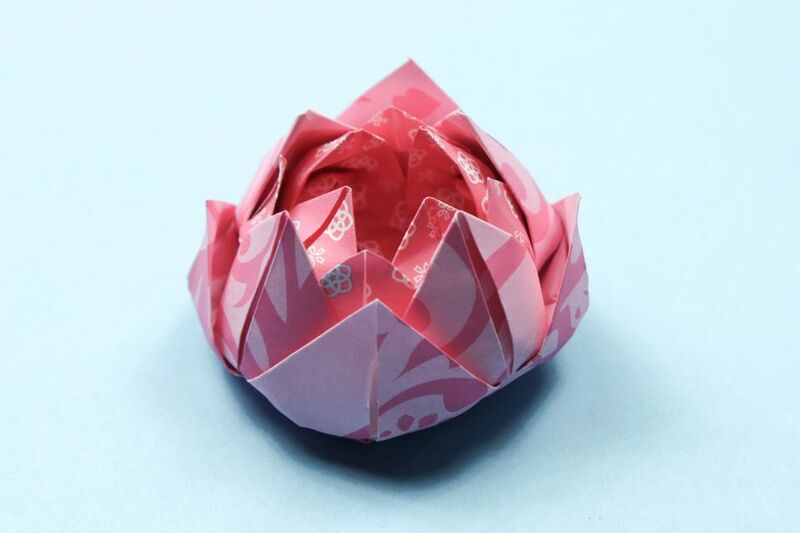 Learn how to make a pretty traditional origami lotus flower with these easy to follow step by step instructions. Make a beautiful origami flower and give it as gift, add to a bouquet or use a decoration on top of a box. This origami flower is one of my favourite models, you can make this out of a paper or fabric napkin as well. I like to get several different sized square papers and make them into lotus's of different sizes, you can nest them inside each other too! For this origami model, I'd suggest using the thinnest paper you can find, at the biggest size to start with, as the final flower ends up becoming very small. It can be tricky to form the petals, but with practice and patience, you will succeed! If you like flowers, I have some pretty printable origami paper in a peony pattern for free from Paper Crystal here. Start with your paper white side up! 1. Fold your paper in half diagonally both ways. 2. We will be folding the corners to the middle. 3. Fold all of the corners to the middle. 4. For the second time, fold the corners to the middle. 5 - 7. Fold all the corners to the middle for a third time. 8. Turn the paper over to the back. 9. Fold all the corners to the middle for the last time. 10. Take some times flattening the folds. 11. Make a small pinch on a corner. 12. Holding onto the pinch, pull at the layer of paper on the back. 13. Flip the paper over and while still holding the pinch, gently but firmly pull the paper out and over to the other side. 14. This is what you should have - if your paper ripped, don't worry, a lot of the time this can happen! 15. On the inside of the petal, flip the little triangle upwards. 16. Repeat the process on the other three corners. 17. Pull the next layer of flaps over to the front. 18. Carefully straighten them out. 19. Open out the lotus a bit. 20. Maybe you could make a smaller or larger one and pop it inside!